Sunwook Kim lives in London, and came to international recognition when he won the prestigious Leeds International Piano Competition in 2006, aged just 18, becoming the competition’s youngest winner for 40 years, as well as its first Asian winner. His performance of Brahms’s Concerto No.1 with the Hallé Orchestra and Sir Mark Elder in the competition’s finals attracted unanimous praise from the press. Since then, he has established a reputation as one of the finest pianists of his generation, appearing as a concerto soloist in the subscription series of some of the world’s leading orchestras, including the London Symphony Orchestra (Gardiner, Harding), Concertgebouw Orchestra (Chung), Berlin Radio Symphony (Janowski), NDR Sinfonieorchester Hamburg, Finnish Radio Symphony (Oramo, Manze, Sokhiev), Philharmonia Orchestra (Ashkenazy, Valcuha, Gardner), London Philharmonic (Sinaisky), Radio-France Philharmonic (Chung), NHK Symphony (Steffens), Hallé Orchestra (Elder), and the Bournemouth Symphony Orchestra for his BBC Proms debut in Summer 2014. 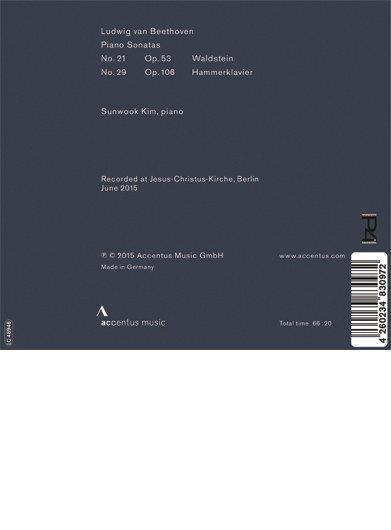 As a recitalist, Sunwook Kim is a regular guest at the prestigious “Piano 4 Etoiles” series at Salle Pleyel and Philharmonie in Paris, and has also made noted appearances at the Wigmore Hall, the London International Piano Series (Queen Elizabeth Hall), Teatro Colon Buenos Aires, La Roque d’Antheron International Piano Festival in France, Kioi Hall in Tokyo, Symphony Hall Osaka, Seoul Arts Centre, Brussels Klara Festival, Beethoven-Haus Bonn, Klavier-Festival Ruhr and Mecklenburg-Vorpommern Festspiele. He has also presented a highly successful complete cycle of the Beethoven Sonatas at the LG Arts Centre in Seoul. Born in Seoul in 1988, Sunwook Kim began the piano at the age of 3. He gave his debut recital aged just 10, and this was followed by his concerto debut two years later. He graduated from the Korean National University of Arts in February 2008, and then completed an MA in conducting at the Royal Academy of Music. Besides Leeds, international awards include the first prize at the 2004 Ettlingen Competition (Germany) and the 2005 Clara Haskil Competition (Switzerland). In 2013, Sunwook was selected by the Beethoven-Haus Bonn to become the first beneficiary of its new Mentoring Programme, a status which grants him exclusive access to the house’s unique collections and resources.